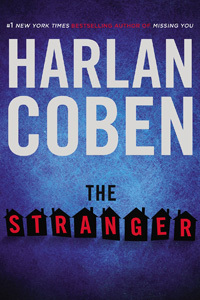 The Stranger by Harlan Coben: Synopsis and Online Purchase Options. Synopsis (from the publisher): The Stranger appears out of nowhere, perhaps in a bar, or a parking lot, or at the grocery store. His identity is unknown. His motives are unclear. His information is undeniable. Then he whispers a few words in your ear and disappears, leaving you picking up the pieces of your shattered world. Then he runs into the Stranger. When he learns a devastating secret about his wife, Corinne, he confronts her, and the mirage of perfection disappears as if it never existed at all. Soon Adam finds himself tangled in something far darker than even Corinne's deception, and realizes that if he doesn't make exactly the right moves, the conspiracy he's stumbled into will not only ruin lives — it will end them.